Harrison County Fairgrounds is a multipurpose comprehensive sports and entertainment complex situated on 640 acres. The complex offers a unique combination of events and leisure activities from family picnics to world-class sporting events. The Harrison County Fairgrounds has eight regulation-size soccer fields, 3 permanent outdoor arenas, 46 RV sites with water & electricity, a covered arena with 130’ x 250’ floor space – encompassing one acre of covered seating with permanent bleachers, 8 pads for temporary stalls with electric & water, large warm up area, PA system, Lighting, Concession Stand, and Restrooms with Showers. The Fairgrounds hosts national events such as The Gulf Coast Winter Classics, rodeos, horse shows, concerts, and motorcross. The fields adapt easily for rugby matches, model airplane flying, driving ranges and more. The complex is located 8 miles north Interstate 10 off Exit 28, and operated under the Parks & Recreation Department of Harrison County. 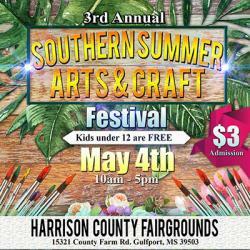 Enjoy music, great southern food, lots of vendors, art, crafts and other handmade items. There will be give aways throughout the show, bouncy houses for the kids while you shop and much more. Flea market and arts and craft show has artists from all over the southeast, local farmer's produce, tons of hand made merchandise as well as fun for the children and an open concession.